When I saw an Occupational Therapist, (OT), a while ago, I took the opportunity to ask her if she knew of anything that might help me become a bit more independent in the kitchen. If you’ve been following this blog for a while, then you’ll know that cooking is something I’m keen to get better at. I’ve even made it one of my New Year’s Resolutions for 2014. She said that the hospital could loan me some pieces of equipment that I could I try to see how they worked for me and figure out if they would be worth me buying. She loaned me a chopping board with spikes on a while ago, and said that she would try and get hold of something called a rocker knife so me to have a go with one of those too. 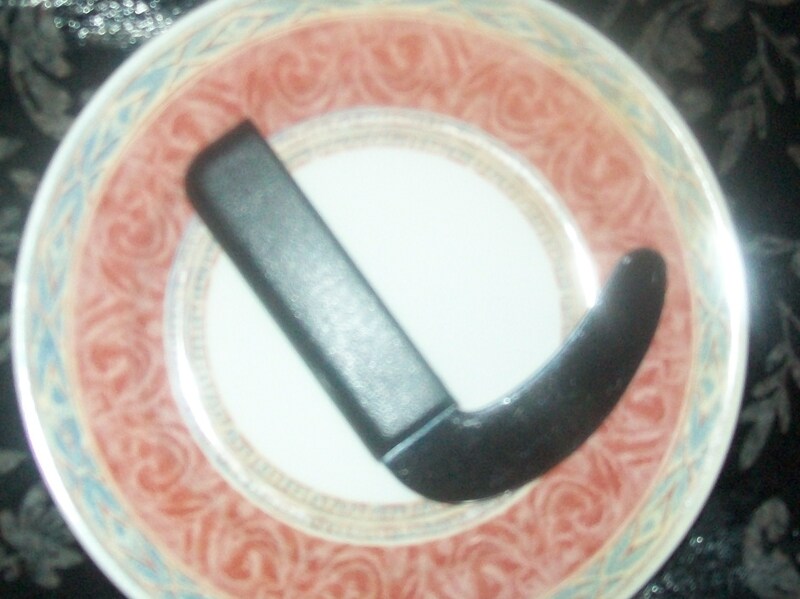 The one she loaned me is pictured above, and I suppose it is the kind that you would use to eat your dinner with on an evening and things like that, but she said that they come in other types as well, like bread knives, if I found them useful and wanted to buy some. I’ve been looking forward to trying out the knife since she mentioned it, because cutting up food is something that I find quite hard at times. How hard depends on what food it is. Things like bananas don’t cause me too many problems, but things like certain types of meat, sandwiches with a few fillings in, and pizza do, to name but a few. I still struggle to use a piazza cutter. Of course, the size of the plate makes a difference too because I find cutting things harder if they’re on a small one. I often say that people sitting close to me at the table may not want to sit too close in case they end up wearing my meal. How much I’m joking will depend on what the meal is. I tried using this knife because the OT suggested that it might be easier for me. I’m not a professional so I can’t say if these would work, or be suitable for other people to use. I can only write this post as a reflection of how I felt using this kind of knife worked for me. The rocker knife is curved so that you cut your food by moving it in rocking motion, rather than pushing and pulling your knife back and forth to cut food. For the purposes of this blog post I used it when I was eating a jacket potato because I was making the meal for myself and I find them really quick to make, and I only have to use the microwave to do it. I know that jacket potatoes are usually quite soft on the inside. I sometimes have trouble cutting through the skin, especially if I’ve left it cooking for a bit too long. This happens more than I would care to admit. At first, it was a little strange getting used to moving the cutlery a different way to what I am used to, but this passed pretty quickly. Although some of the skin still took a bit of getting through, I got the feeling it was probably easier than it would have been otherwise. Because it is quite wide at the edge, I also found it helped when using the knife to push food onto my fork too, which I’d never really considered before I started using it. I’ll also be experimenting with how easy I find it to use with other foods before I have to return it, although I don’t know what these will be yet. Then I’ll make a decision about if I want to buy one for myself or not. Hmmm pretty cool Nic! I am wondering with using your hands, is the issue high or low tone and or spasticity. My daughter struggles with cutlery still – although she can hold a spoon or fork and eat with it, she benefits from much thicker handles on them, and has some difficulty caused by an internal rotation. She generally resorts back to using fingers as it is simply requires less effort and though and she can concentrate on enjoying her food rather than getting it into her mouth! She isn’t using fork and knife together yet and struggles to get her wrist/fingers in the right position for using a knife effectvely anyway. So I was just wondering what’s behind certain utensils being difficult if that’s ok?? Hi Angela. I don’t really have any trouble holding the cutlery itself, but if I use a knife and fork together I swap hands all the way through the meal, depending on what I’m going. If I’m piercing something with my fork, I will hold the fork in my right hand ( which is my strong side) and the knife in my left. However, when I want to cut something up I wlll swap things so that the knife is in my strong hand to do the cutting and have the fork in my left. Sometimes, I struggle to keep the food still while I’m cutting it up and it slides around all over the plate. Depending on what I’m eating though I still have to get someone to help me, especially if it’s ‘hard’ or tough food, I’m i’m making food for myself I’ll often just chop it up with a pair of sissors instead before I put it on the plate so that I don’t have to use a knife.